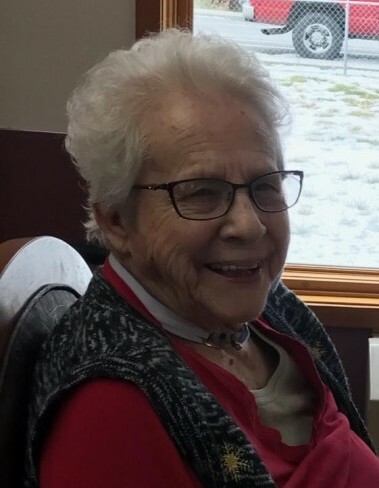 Virginia Marie Moore, 94, of Long Creek, Oregon passed away at her residence in the Blue Mountain Care Center in Prairie City. A graveside service will be held on Saturday, February 16, 2019, at 1:00 PM at the Canyon City Cemetery in Canyon City, Oregon. A reception will be held at the John Day Senior Center after the service has concluded. Virginia was born on July 31, 1924 in Elk, Washington to Edward Andrew and Mary Lena (Meents) Moulton. She went to high school for three years in Newport, Washington and one year in Dayville, Oregon. After high school, Virginia attended business college in Spokane, Washington. She worked as a bookkeeper for the City of Long Creek. On September 2, 1946, Virginia married Don Chesnut Moore in Dayville, Oregon. Together they had two children, William Edward and Joyce Ann. She enjoyed fishing, camping, sewing, gardening, painting, knitting and quilting. She spent many years as a 4H Leader and member of the American Legion Alexander Harper and Dayville and Dayville Presbyterian Church. She was also a member of Auxiliary and Home Extension Grant County. Her greatest accomplishments included raising her two children and four grandchildren and fishing out all streams, rivers, and lakes in Eastern Oregon. Survivors include her son, William Edward Moore (Bruna) of Karlsruhe, Germany; grandchildren: Tammi Lee Moore Schröder of Gernsbach, Germany; Billi Lin Moore Elk of Heuchlingen, Germany; Kenneth Ralph Reade (De Anna) of Pendleton, Oregon; Douglas Don Reade of Lebanon, Oregon; and many great-grandchildren. She is also survived by her special friends Myla, Mike, Max and Ben Corley of Long Creek, Oregon. She was preceded in death by her husband, Don Chesnut Moore; daughter, Joyce Ann; sister, Carol Ann Moulton; and parents, Edward and Mary Moulton. Memorial contributions in memory of Virginia can be made to the Long Creek Volunteer EMT Ambulance through Driskill Memorial Chapel at 241 S. Canyon Blvd., John Day, OR 97845.